The international community is moving towards peace talks to stop the war in Yemen, particularly after the worst deterioration in human conditions the world has seen this century. Children are dying of famine, and suicides are on the rise as a result of the worsening economic conditions of families who believe taking their own lives is better than enduring hunger and humiliation. UN Envoy to Yemen Martin Griffiths earlier announced at the Security Council that the Yemeni government and Houthi militias have shown commitment to attend peace talks, in addition to the coalition’s agreement to logistical arrangements to lay the groundwork for negotiations. These include medical evacuation operations from Sanaa. Griffiths also stated that he was close to closing a prisoners’ swap deal. This comes at a time of implicit ceasefire in Hodaida, interrupted by occasional flare-ups. Meanwhile, Mohamed Ali Al-Houthi, head of the so-called Revolutionary Committee, spoke of an initiative to halt firing missiles and drones at coalition and government forces and his willingness to stop all military operations. A few hours later, however, a ballistic missile was fired at coalition and government forces. Yemeni official sources said the Stockholm negotiations planned for 4 December were postponed for two days over disagreement as to who would attend, and over the fate of Hodaida Port. The recognised Yemen government asserted its delegation will fly to Sweden as soon as the Houthi delegation arrives in Stockholm, saying that the failure of negotiations will mean the government will control Hodaida and that it grew bored of Houthi prevarications to reach a peaceful settlement in Yemen. The UN said it was not raising its expectations, all while working hard to convene a successful round of peace negotiations. On the other hand, political analysts point out that Houthi militias are the real reason why the peace talks are failing, and that they – the Houthis – don’t care for the welfare of Yemen and the Yemenis. Some analysts believe the international community should not settle matters with the Houthis, who don’t recognise UN Resolution 2216 nor believe in a political solution for Yemen’s predicament. The Houthis are pending their agreement to attend the Stockholm talks upon the international community’s approval of their demands. The Yemen government, meanwhile, announced it was heading to Sweden based on three conditions: putting Yemeni conditions into consideration; that the coming talks be based on the previous ones in order not to go back to square one; that the Houthis assert they are to attend the Stockholm talks and to forego their previous excuses. 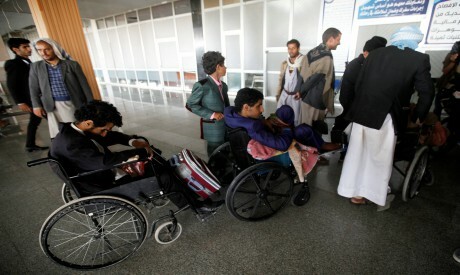 Colonel Turki Al-Malki, spokesman of the coalition and government forces, stated on Monday that the coalition had agreed, upon the request of Griffiths, on the evacuation of 50 wounded Houthi militants to Muscat, Oman, “for humanitarian considerations and as part of confidence-building measures” ahead of the Stockholm talks, reported Nas Times. The UAE’s Al-Bayan newspaper wrote Yemeni sources said “the legitimate government signed a UN-sponsored deal to exchange prisoners after it was signed by the Houthis” when Griffiths visited Sanaa. In France, the Paris Peace Forum held a seminar on Yemen at the Tour Montparnasse. The forum discussed conflicting UN reports on humanitarian rights in Yemen, citing findings of Human Rights Council experts, and the inconsistency in Western officials’ statements in the media to those of UN decisions and resolutions. The forum focused on humanitarian aid and relief works and the importance of joining hands to save the Yemenis from the dangers of the four-year war. He added that it was not too late to save it. As Lowcock wrapped up a visit to Yemen, he stated the country had deteriorated alarmingly since his last visit in October 2017. “In Aden, I met emaciated children so malnourished that they could barely open their eyes. Humanitarian assistance helps many of these children recover. But I also heard heart-breaking stories of children relapsing again and again because their families simply can’t afford food or proper medical care,” he said. Lowcock said he was optimistic the Yemeni government would participate in the talks in Sweden, stressing the war must be ended and Yemenis deserve a brighter future. A Saudi-led quartet met with leading UN officials at the headquarters of the Saudi Development and Reconstruction Programme for Yemen in Riyadh. After the meeting Saudi Ambassador to Yemen Mohamed bin Said Al-Jaber said that Riyadh is working to improve the Yemeni economy, especially after the kingdom interfered to raise the value of the Yemeni riyal vis-à-vis foreign currencies. He added that two deposits, $2 billion to the Central Bank of Yemen (CBY) and another worth $200 million, had been made to help bolster Yemen’s economy. Mohamed Zammam, CBY governor, told Saba Net, Yemen’s official news agency, that “the fair price for the Yemeni riyal is 450 riyals against one dollar and against 120 Saudi riyals”. He added: “This improvement is the result of monetary reform policies such as managing the monetary sum with the right economic means, effecting public debt instruments at 100 billion riyals, stopping uncovered spending to cover for the government’s budget deficit and increasing interest rates to 28 per cent to collect a reserve of local currency” worth 500 billion riyals. Zammam asserted that oil, brought in from the Saudi grant, was flowing to most Yemeni governorates and that arrangements were afoot with UN organisations to receive their aid through the CBY. He added that countries and associations are working jointly for the recovery of the local currency and to end Yemen’s economic challenges. During his meeting with US Ambassador to Yemen Matthew Tueller on Sunday, Zammam called on the international community to support the CBY in its efforts to stabilise the economy and revive the national currency, according to Saba Net. Zammam stressed it was important for international and regional organisations to use CBY channels to make transfers. The international community is seeking peaceful solutions to Yemen’s political predicament and humanitarian suffering. The next few weeks will reveal whether peace talks will succeed. If they don’t, who will be to blame? Will there be punitive measures taken? Are the Houthis really the masters of their own decisions?